The images are jarring at times but always incredibly human. 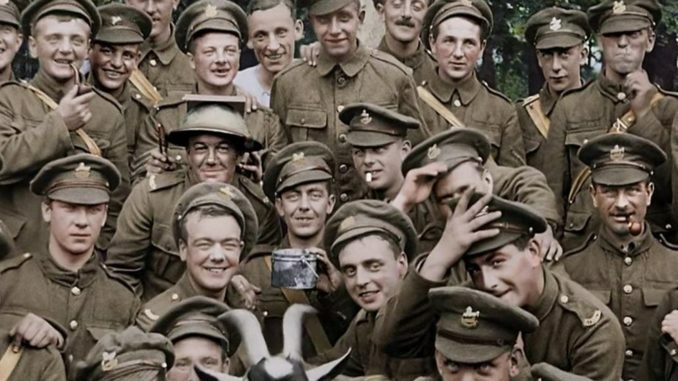 Peter Jackson’s “They Shall Not Grow Old” is a documentary of the highest class and should be on any history fan’s must watch list. The “Lord of the Rings” director has created a unique view into the experiences of British WWI soldiers. One thing that sets this film apart from other documentaries is the method by which Jackson and his team at Weta Digital have restored the footage. They corrected the framerate of the footage to give it more natural movement and get rid of the fast, jittery look of films from the era. They also went through and added color to the scenes to make them that much more approachable to a modern audience. The final modification done to bring the films to life is the addition of sound. Foley artists have painstakingly gone through every scene that appears on screen and recreated the sounds that occurred at the time, even going so far as to lip sync those seen speaking in frame. In one, an artillery piece launches a shell and several slate shingles clatter to the ground from a nearby barn. In another, a group of soldiers sits in a meadow playing instruments to pass the time. One man who does not have an instrument plays a bottle as if it were a guitar, his fingernails clinking on the glass. Rather than bring in experts to sit in front of a camera and talk about the war and its effect, Jackson has opted to narrate the entire film with audio from interviews with the soldiers themselves. This gives the documentary a distinctly intimate feel. Soldiers tell stories as they recall them. You could close your eyes and almost feel as though you were walking with them through the trenches. The narrative follows the full course of the war, beginning with young boys eager to sign up to fight for their homeland and ending with weary men having to contend with the struggles of reintegrating into civilian life. In the beginning, everyone was excited to go to war. Many of the soldiers tell stories of how they lied about their ages to get into the Army. “That’s too young. You better step outside and have a birthday,” one recruiter told a young man who had given his actual age. A common theme of these accounts from early in the war is the boredom associated with war. Many of the clips from the trenches show men joking around with one another often laughing at their own mistakes and trying to bring some levity to the gravity of their situation. As the war moved on, things became more brutal. Soldiers recount the advent of gas attacks and the panic of having to put on a gas mask. Men who didn’t have proper masks sometimes had to resort to using urine-soaked handkerchiefs to keep the chemicals out. They tell stories of men having their brains blown out right in front of their comrades as they charged the German trenches. Bodies lay decaying everywhere and showed WWI for the horror it really was. Soldiers would steal equipment from the corpses of their comrades because many of these items were hard to come by. The film ends with the soldiers coming home with a whole host of new issues. One recounted that nobody wanted to talk about the war. Another man said that when his mother came up to his room the first morning after he got back from the war, she found that he had abandoned his bed to sleep on the floor. Now a century past, WWI is brought to a new generation through this film. “They Shall Not Grow Old” has had a limited theatrical release in the U.S. but is now available for digital download and rental on several online streaming services. This is an excellent article on a brilliant movie. I have not personally seen this movie; however, after reading this well crafted article, I now have a new movie to look forward to watching soon. Interesting, I knew a Butera – Paul – back in the 60’s who was in my Gothic Lit class at Witt.